Bro. 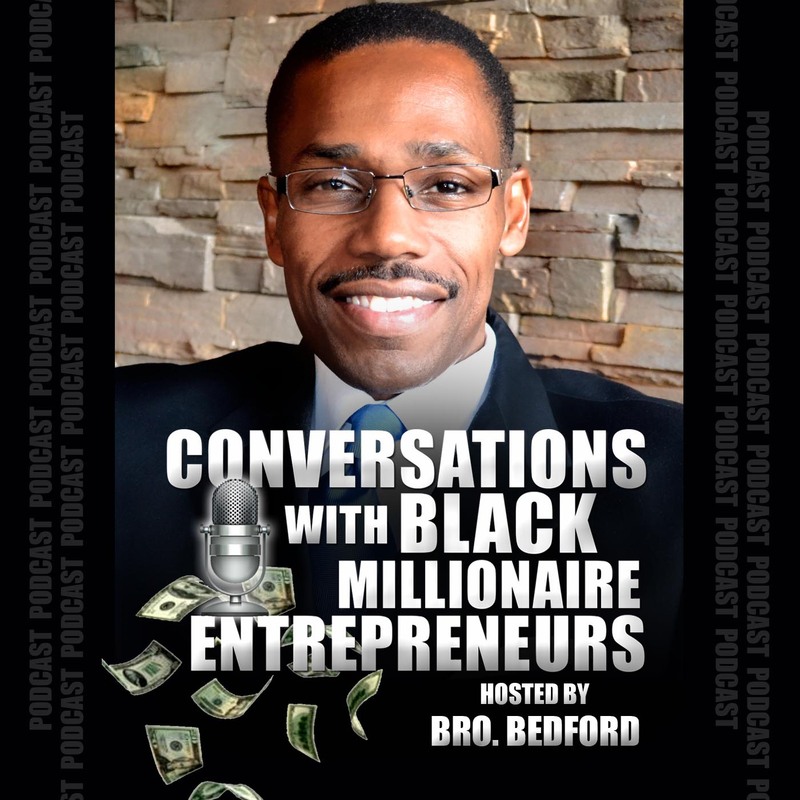 Bedford Introduces the 'Conversations With Black Millionaire Entrepreneurs' Podcast. Bro. Bedford has an eye opening discussion with multiple Best-selling author and Black Business Hall of Fame inductee George Fraser. George shares the #1 skill you must possess in order to be a successful entrepreneurs. He details the 5 hurdles that you will have to overcome. And he shares the 10 best business opportunities in America for black people to get in. Bro. Bedford has a profound conversation with Best-Selling co-author of the legendary Think and Grow Rich: A Black Choice and The Wealth Choice: Success Secrets of Black Millionaires. Dr. Kimbro and Bro. Bedford discuss the characteristics and traits of millionaire entrepreneurs as well as the mindset you must have to be successful. Bro. Bedford has a conversation with the iconic founder of Radio One and TV One, Cathy Hughes. Cathy Hughes talked about Overcoming Sexism and the importance of a Banking relationship. Ms. Hughes also discussed the study behind her creating the #1 radio format in the History of Urban Radio. Bro. Bedford has a conversation with the Season 4 winner of NBC's Donald Trump's Apprentice, Dr. Randal Pinkett. Bro. Bedford has a conversation with business Titan Mike Roberts. Mr. Roberts gives you the nuts and bolts to his business philosophy that has made him and his brother to of the most successful Black Entrepreneurs in our history. Bro. Bedford has a very Spirited conversation with Star of 'The Secret' Lisa Nichols. In this entertaining interview Bro. Bedford and Les Brown discuss how to be an effective Speaker & Developing Communication skills. Les Brown also shares how to develop your Mindset & Mental Conditioning. Bro. Bedford has an uplifting and very inspiring conversation with the always on fire Ken Brown. Ken Brown answers the question... Should I buy a Franchise or Not? and much, much more! Dr. Willie Jolley shares how you can turn a Setback into Comeback!! Bro. Bedford has an engaging conversation with former CEO of 2 Fortune 500 Companies Keith Wyche. This is rare air here, there are not too many people on the planet who can take you into the mind of running 2 Fortune 500 companies and turning them around, but also building his own company and brand to millions of dollars. Bro. Bedford has a conversation with Dr. Venus Opal Reese that takes you on a transformative journey from homeless to Millionaire Entrepreneur. Bro. Bedford and Ty Cohen shares how the Internet Can Make You A Millionaire! In this insightful interview Myron Golden shared his secret to Making Millions in the Network Marketing Industry! Bro. Bedford has an electric conversation with the Founder of The Hart Zone Suzan Hart. Episode 020 Conversation With Bennie Randall Jr.
Bro. Bedford has a revealing conversation with Bennie Randall on how he went from "stranded on a toilet seat to Medial Mogul". One Of My Favorite Interviews. Butch Lewis was behind the scenes of so many powerful things happening. He was also connected and respected by so many people in the world of entertainment. Here's another Powerful Episode with my Brother from another Mother. Professor Devin Robinson. You don't want to miss the nuggets in this conversation. Wow! Bro. Bedford has a very Uplifting and Spirited conversation with Simon T. Bailey. You're gonna love this. Please don't forget to share...somebody needs to hear this.